A train to Melbourne Airport, increasing the capacity of metro rail and the East West Link are vital to easing congestion on Melbourne roads, according to the Royal Automobile Club of Victoria (RACV). Completing the Metropolitan Ring Road and the Dandenong rail line would also ease Melbourne’s traffic congestion and avoid stifling economic productivity. RACV general manager public policy Brian Negus says the RoyalAuto survey, on which the Directions report is based, provides a valuable insight into views of motorists. 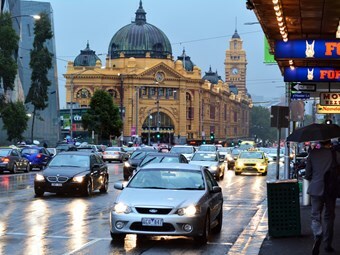 "We believe that this research reflects general community sentiment about the issues that concern Victorians when it comes to transport and liveability," he says. "On average there is an RACV member in three out of four Victorian households. "So this research and consultation is invaluable as it gives us access to the views of a significant cross section of the community." Removing level crossings across metropolitan Melbourne within the next five or ten years, is another key improvement the RACV feels must be honoured. The infamous Hoddle Street and the Monash Freeway at Warrigal Road are parts of the city identified in the report as needing urgent attention. The introduction of 24 hour a day, seven day a week clearways on major arterial roads has been suggested as one possible solution. Balancing the needs of drivers and public transport users and prioritising projects based on solid research, is essential, when it comes to easing congestion. "It’s not about one mode of transport versus another," Negus says. "A successful transport network is about achieving a balance between the needs of the different users. "Victoria’s economy and future growth depends on a transport network that moves people and goods safely efficiently and reliably and we believe RACV’s Directions 2015 blueprint outlines the vision needed to achieve this."